A protective helm that is difficult, or impossible to wear, is not worth much. This 17th Century Closed Burgonet blends protection and comfort perfectly. 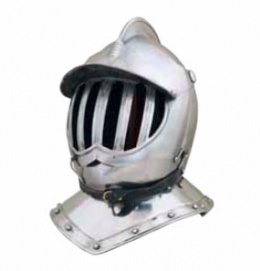 Crafted entirely in 16 gauge steel, this helmet is thick enough and heavy enough to provide a solid level of protection, making it a perfect choice for reenactment and SCA events both. The burgonet style of the helmet offers complete protection all the way around the head, and even down onto the collar, while the grate-styled face-mask ensures good protection without sacrificing vision or ventilation. A crest and visor offer a bit more detailing to the helmet, while also serving to enhance its defensive strengths. The interior of the helmet is fully padded, which only makes it all the more easy to wear, while also ensuring that blows to the helm are dampened a bit. The visor rotates and the helm splits open for easy donning, while also featuring rotating hook closures, and a buckled belt closure about the collar, for added security. Add in that this helmet is based entirely on a historical piece (a prized part of the Hermann Historica collection), and that makes this 17th Century Closed Burgonet a fine addition to any collection, both as a great display piece and as a functional helm for you to wear when you march into battle. The 17c Closed Burgonet was based on the barred visor helms often worn by cuirassiers in the 16th and 17th centuries. A similar closed burgonet can be found in the collection of the Higgins Armory Museum. This page was last modified on 21 April 2014, at 16:35.